Sometimes you need a recipe. Like that bread we all made yesterday, that recipe was good. Sometimes cooking requires precision. But often it just requires inspiration. I have had some comments recently about my recipe-writing style on this blog. I often call for a pinch, a dab, a scoop, a handful. Meaning: use the amount that seems right to you, you know your tastebuds best. So far, all the comments I’ve received about this approach have been positive. It seems that many of you, like me, enjoy reading recipes because they spark a good idea about technique, or flavor combinations, or because they remind you to use up that cauliflower that’s languishing in the back of the fridge. It is in that spirit that I bring you the “recipe” below. It’s just an idea, and not even my own original idea (how many recipes are really original?). I saw this idea somewhere recently, I can’t remember where, and it stuck with me and came to mind when I needed it. And it was absolutely delicious. To me, that’s a good recipe. Scoop some coconut oil and Thai curry paste into a bowl. (I used yellow curry paste, but red or green would also be great.) Warm briefly in the microwave to melt the coconut oil–and because, wow, doesn’t that smell GREAT? 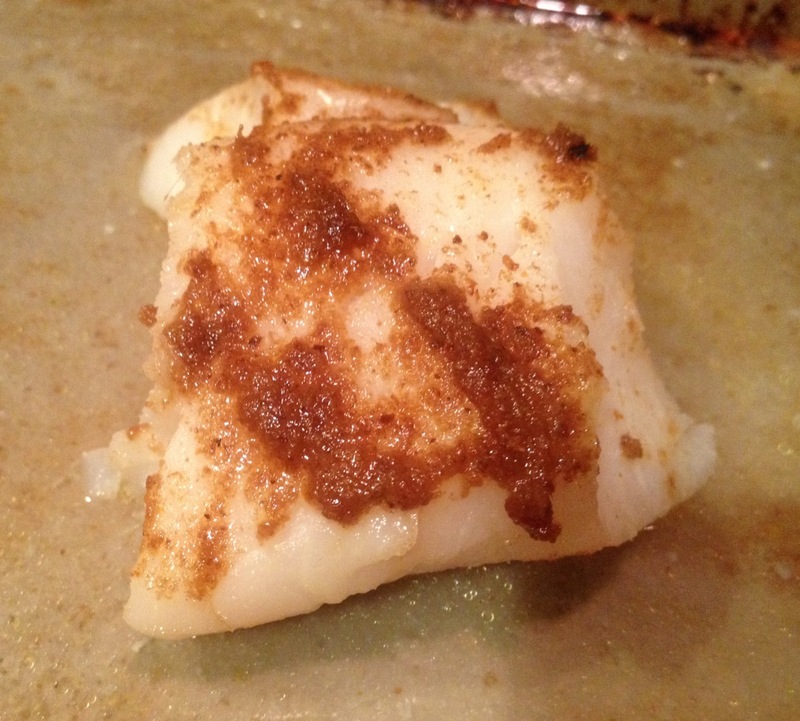 Spoon thickly over fish and bake at 450 until the fish flakes when you cut into it. Cooking time will depend on the thickness of the fish. This entry was posted in Asian Flavors, Fish and tagged cooking, dinner, fish, food, homemade, lifestyle, recipes on February 26, 2012 by emmycooks. What type of curry paste is your favorite? And what did you serve this with? Well my FAVORITE would be a homemade curry paste, but in this case I used a prepared Mae Ploy yellow curry paste that I had in my fridge. And it was great. I think this would be good with any red/yellow/green curry paste that you like, though. If you’re buying curry paste, I find that it’s kind of trial and error, you have to try them to find a brand that has good flavor in addition to just being spicy. I served the fish with brown rice and a stir-fry of brussels sprouts, mushrooms, green onions and tofu (for a visiting non-fish eater, or so I thought–but he tried the fish and then took more!). Super simple and so delicious – curry works so well with white fish. I love it! Yummy!! I was thinking a Thai curry paste? Either red or green? Yes, I used a Thai curry paste, I should have been more specific! I will update the recipe now. I do think red, green or yellow would be great–or any variation if you’re making your own! Your blog looks delicious! I love coconut curry. This is a must – try! :) Thank you for sharing! You’re so welcome! I like curries as well, and if you start with your curry paste already made I like that they are so quick to make. Enjoy! This looks absolutely amazing. I’ve always been scarred to cook fish… but here I go. I’m going to try this. So glad to hear it! It’s an easy way to start. I think the trickiest part is knowing when the fish is cooked–I say just cut into it and pull it apart a bit with the knife. As soon as it comes apart easily into flakes, it’s done. If part flakes but part doesn’t, give it a little more time if you want it cooked through.